Ivanka Trump Says What Her Father Refused To Say - Joe.My.God. 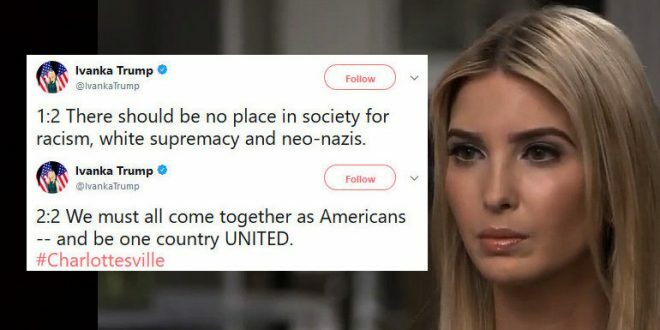 First Daughter Ivanka Trump denounced white nationalists following the deadly clashes in Charlottesville, Va., something her father has failed to do. “There should be no place in society for racism, white supremacy and neo-nazis,” Trump wrote in a two-part tweet Sunday morning. Trump’s condemnation comes one day after her father refused to shame the hate groups — opting to put the blame “on many sides.” President Trump’s remarks were panned by members of both political parties, who said the white nationalists, neo-Nazis and neo-Confederates were at fault for the violence.